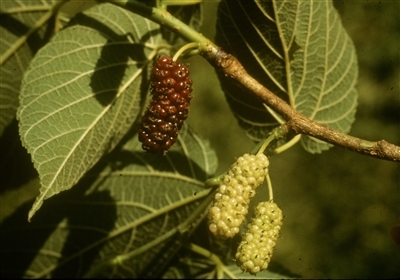 Morus Rubra.L. Mellichamp.MICHIGAN FLORA ONLINE. A. A. Reznicek, E. G. Voss, & B. S. Walters. February 2011. University of Michigan. Web. 1-22-2015. http://michiganflora.net/home.aspx. (Accessed 1/2015). Morus rubra is a tree to 20 m tall, bark red-brown. Leaves hairy below, rough above, veins impressed above, base lobes equal, (Petrides 1988) winter buds greenish-brown. Flowers dioecious or monoecious, tiny, in short catkins; blooms April-May. Fruit multiple drupes, dark purple, June-Aug. Seed load 4%. Pulp nutrients: water 86%, lipid 1%, protein 6%, CHO 66% (White 1989). Morus rubra.flowers.copyright 1997-2017 David G. Smith.delawarewildflowers.org (Accessed 1/2017). Habitat: Prefers rich, moist woods and upper flood plains, soil pH 6.3-8. Tolerant of salt, drought. Moderately tolerant of flooding, soil compaction, shade, index 4-6, but usually establishes in open areas. Notes: Difficult to distinguish from M. alba, an exotic, which is much more common. Infected by the leaf spot fungus Mycosphaerella mori (Ascomycotina) and the bacterial leaf spot Pseudomonas mori. 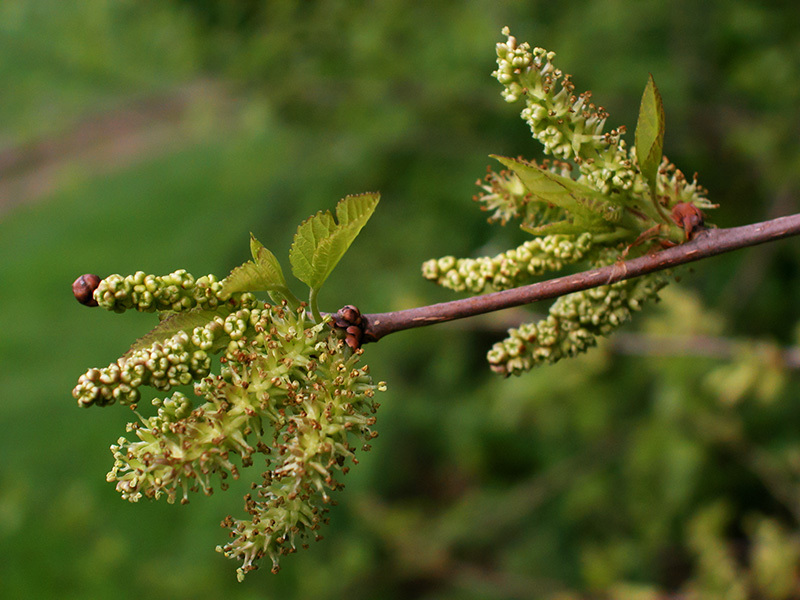 It is also attacked by the mulberry borer, Doraschema wildii (Burns and Honkala 1990).